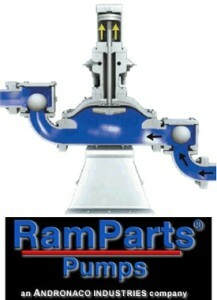 RamParts Pumps - Processflo, Inc. The rugged construction and extra-thick pump casing of RamParts air-driven diaphragm pumps stand up to the abuses of the most demanding sludge and slurry applications. They overcome the “high-wear” problem commonly found in double diaphragm and progressive cavity pumps. Options include: pulsation stabilizers, suction elbows, pump stands with or without casters, diaphragm failure detection and NEMA 4X control panels.